Surely one of the most defining house records ever made and an out-and-out classic, Soulsearcher's 'Can't Get Enough!' was first released on Soulfuric Deep, then licensed to Defected Records where it reached #8 in the UK charts. 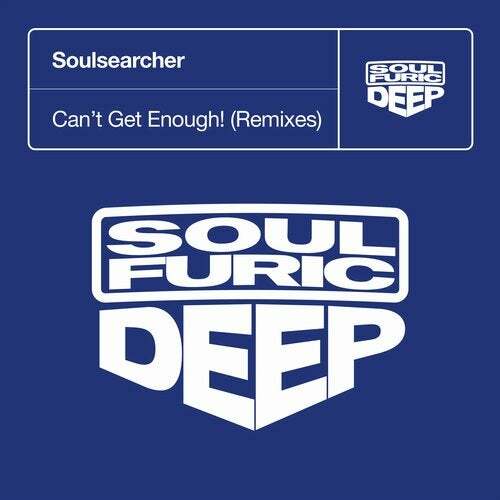 Returning to Soulfuric Deep with a package of five quality remixes, it's clear that 'Can't Get Enough!' is still resonating on dancefloors 20 years later. Flourishing duo Illyus & Barrientos present two remixes, the Last Boogie Mix introducing a piano riff and Club Refix going deep with a tougher club sensibility. Dr Packer maintains all the original's most iconic elements, the euphoric vocals and timeless groove given a fresh-sounding elasticity. Finally, Angelo Ferreri presents two mixes, with the Vocal Remix already being a favourite with DJ's long before its release. The Vocal Remix is an undoubtedly modern take on the classic, giving it more of a peak-time feel with bouncing production and a rolling groove. Angelo's Sweety Remix loops alternative vocal moments with looser percussion for a more laidback approach. It's not easy to do justice to an ultimate soulful, vocal house banger but these three remixers have achieved greatness, taking this beautiful record in some welcome new directions.